In a very even match-up, "The Kumander" Rene Dacquel (20-8-1, 6 KO's) of Abra Province battles bantamweight Giovanni Escaner (18-3, 11 KO's) of Sultan Kudarat in the exciting main event of the Marty Elorde Promotions card scheduled for this Saturday (Dec 22) at the popular Elorde Sports Complex in Parañaque, Metro Manila. The 27 year-old Giovanni Escaner - a former interim WBA Asia champion - seems to have the momentum in his favor after scoring consecutive wins in his last seven combats, wanting to end 2018 with another knockout win. However, the tough Dacquel is an experienced warrior who has endured setbacks in Australia and South Africa, but whose confidence is at 100%. So who will win? In the co-feature, brave Robin Langres (9-2, 4 KO's) of Palo, Leyte, rumbles southpaw Jason "Manefisto" Buenaobra (6-3-3, 3 KO's) of Sorsogon in a non-title 10-rounder bantamweight clash that promises fireworks. And that's not all. 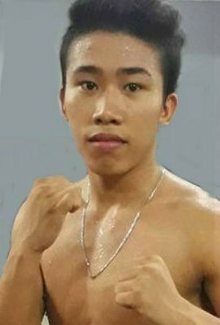 Because unbeaten Aljum "The Nightmare" Pelesio (6-0, 5 KO's) of Misamis squares off southpaw Enrique Magsalin, 23, in a scheduled eight-rounder super flyweight clash. Also, well-trained Kenneth Alquiza, 19, collides against Paolo Sy, 22, in a six-chapter rumble in the 108 pound weight class. Plus exciting women's boxing: Pampangueña warrior girl Floryvic Montero, 23, of the Elorde Boxing Stable clashes against the bigger, more-experienced Amy Berezowski of Canada in a hot 4-rounder war in the minimumweight division, and you can't miss all this! 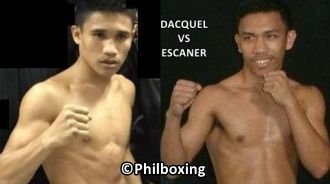 Furthermore, 19 year-old Malfred Majadas engages Rico Saonoy of Lipa City in a non-stop duel that will thrill fans. Plus, Ranelio Quizon of Las Piñas takes on Rolando Plaza of Cagayan de Oro; and rookie Alexander Almacen rumbles for the first time as a pro fighter against Ryan Fullero of Batangas. All these awaits for you! The author Carlos Costa is a Panama-born fight reporter living in Cebu. Carlos can be reached by email Carlos512@hotmail.com and Whatsapp/Viber: +639184538152.